Latest post Thu, Oct 23 2014 7:01 AM by Hemi_e. 3 replies. I work at a newsroom on ISIS 7000 & 2000 , we edit on Avid NewsCutter 9.5.3.6 . Our working frormat is IMX30 MXF SD PAL. Now we have a workstation with Adobe CC connected to the ISIS network. I need to export an Avid timeline to AfterEffects CC , so i can continue my work on the timeline without any export/transcod of media . I am trying to do it by export as AAF (link to media), but when i open the AAF with pro import (default settings) or dragging the AAF directly to AE i get a weird looking image ( attached a screenshot below) . If i do a quick time reference export from Avid the image is o.k. , but as i said - i need to see the timeline. If i transcode to DnxHD or DV25 before sending the image is o.k. , but i cannot change my working format. 1) Is this workflow sounds right ? if not then i would be happy to hear any sugeesttions . 2) anyone knows if IMX30 is supportef by AE?. Thanks for any help, i am kind of stuck. 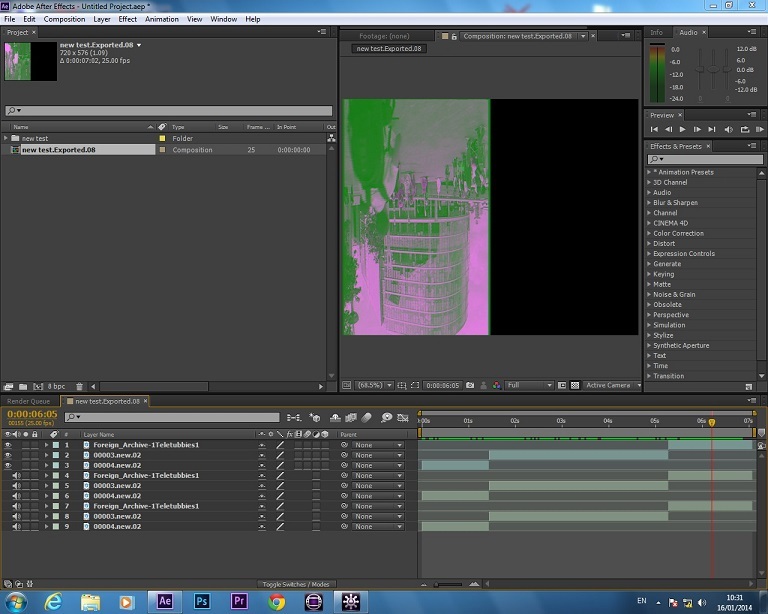 It looks like a decoding problem in AE. So I would try opening an IMX30 file directly in AE w/o using an AAF. You should be able to even open Avid media .mxf files directly in AE, IIRC. solved when upgrading to After Effects CC 2014.